Whether you are a master gardener or just another lawn obsessed property owner in America you are likely dealing with the same problem. Watering your garden or lawn can account for nearly 40 percent of your household’s total water usage, or what’s worse, increase the costs associated with water use by the same margin. For properties that do not have access to city water, the problem is amplified. When a well is used for daily watering during hot, summer months, you run the risk of running the well dry. This can cause ancillary problems that are far worse than the fact that your house won’t have running water for a while. Additionally, well water can be hard, carrying many metals and minerals that must be consistently treated, lest you run the risk of damaging your yard or garden beyond repair, not to mention the risk this poses to your drinking and bathing water, and ultimately, the loved ones who use that water. So what is the solution to the expense and overall downside of dedicating your home’s water source to keeping your landscape design hydrated? Well, humans have been able to summon the answer out of thin air since the first seeds were planted on this earth. The fact of the matter is that the water that comes from intermittent rain storms is plenty to keep your flowers, vegetable gardens, and lawns flourishing all season long. This is especially the case if you have a system in place to preserve rain water that isn’t being directly absorbed by your home’s vegetation. A simple and efficient way to do this is by utilizing a rain barrel. In this article, we outline what exactly a rain barrel is, how to install one, and how to leverage the water it gathers to keep your water bills low and your plants growing high. So What is a Rain Barrel? A rain barrel is a system that gathers and preserves rainwater that runs off your roof. This is the water that would be otherwise wasted. It is lost in your gutter systems and sent down storm drains to streams where it will eventually evaporate in dry seasons. Because the water that comes from the sky is free, installing a rain barrel can decrease your water bills, and limit the size your homes environmental footprint. Diverting some rain water away from municipal storm systems is vital, especially in areas with older, combined sewer/storm systems, which can overflow in heavy rains. In addition, contaminated stormwater can be detrimental to the natural water sources where they eventually lead. The water gathered in your rain barrel will also be without the chemicals used to treat city tap water. Cleaning agents like fluoride and chlorine might be safe for humans but not so for some vegetation types. Most rain barrels are fairly simple to put together. They come in a variety of styles, but most are comprised of food grade plastic and are sized to hold around 50 gallons of water. Certainly though, there are smaller and larger sizes available. Depending on the specific model you purchase, rain barrels can vary in terms how they fit into your home’s runoff, but the following outlines a general installation. 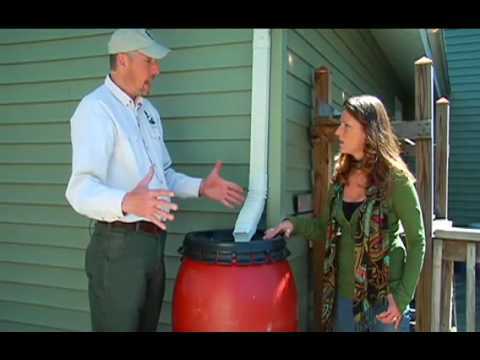 ✓ Survey your home for the best location for your rain barrel. You are looking for level ground, first and foremost. You may want to attach a hose or sprinkler to your rain barrel. In this case, you want the location to be close enough to what needs to watered so that the hose can reach. ✓ Select a model and color that works for the aesthetic of your home. The practical uses of rain barrels do not have to be at the expense of style. Rain barrels come in a wide range of shapes, sizes, patterns, and colors and there is sure to be something out there that fits your needs. Some can even be decorated! ✓ You will want you barrel to be slightly above the ground level to make for easy flow. Facilitate this using concrete blocks, bricks, or pavers to create an elevation up to two feet off the ground. As spigots are typically located at the bottom of the barrel, this lift will also allow you easy hose attachment and access to that spigot. ✓ Install the spigot, overflow valve, and all other hardware according to the barrel’s specifications. Some models may require other tools like a cordless drill in order to make holes. ✓ Some kits come with a downspout diverter. The downspout diverter attaches to a downspout and pulls water from it into the barrel through a hose. The diverter will then close when the barrel is full and the spout will work as normal. ✓ Whether or not a diverter is included or required, there are systems by which multiple barrels can be attached to increase your water preservation capacity. ✓ Cover the top of your barrel with a lid or screen of some sort to keep debris out of your stored water. The lid will also reduce the chances of a mosquito infestation. ✓ You will also want to be sure the gutters and downspouts are clean at all times to that smaller debris stay out of your barrel. Installation of a gutter guard or another type of protective gutter system is recommended. ✓ Occasionally, it is good to flush debris from the container bottom by opening the spigot and letting some water run out. Once you have finished installation, the job is done. Now you can sit and wait for rain. Bet you thought you’d never say that, but after a few good storms and an ensuing dry season, you will be happy for any early season moisture. The rain that gathered in your barrel then will serve you well, keeping your lawn and garden flourishing at no extra expense to you and without rendering your home a drain on precious rain water and the environment at large.